We happened to be in Sudbury during Ribfest, so we got a half rack from Boss Hog’s BBQ. Over there, a half-rack is generous, so we were too full after sharing this to try anything else. We also had some Pappy’s Olde Fashioned Soda. I liked the grape and orange flavours. Butter beer was a bit too sweet. It tasted like butterscotch! I was in Quebec for two days to attend Festival d’été. I explored food in the city a little bit (which I will post separately), but I did grab some food truck eats at the festival to continue my #tianaeatsfestivals hashtag. Food trucks are still a relatively new thing in Québec, as they had local bylaws to change before they could have them, so there wasn’t a giant amount of choice. I did snag a bison grilled cheese sandwich from a nomadic truck called SAGA that was delicious. On the second day, I had some Thai popcorn shrimp from a truck called Food Fighters 504. It’s fun to see what food truck fare is like in different cities. The lines were super long for all of them. Here’s hoping more come to Quebec soon! 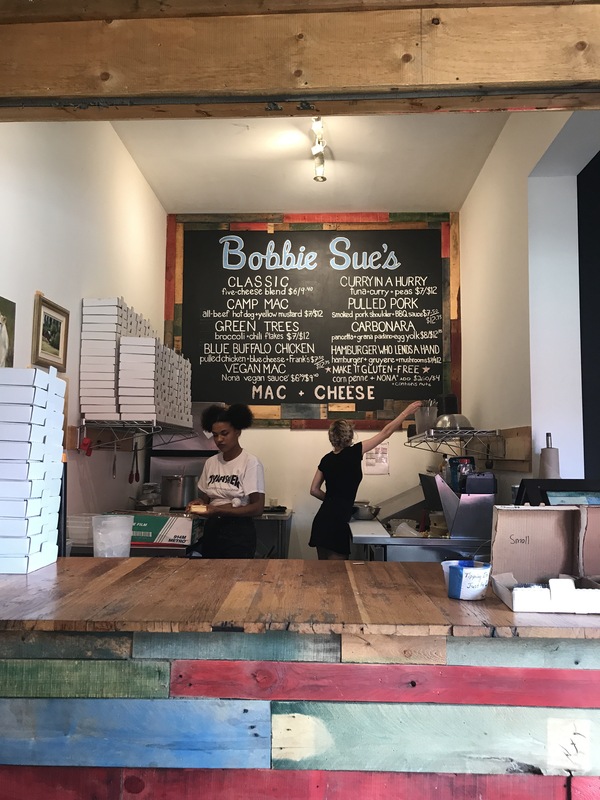 Over the weekend, I went to Bobbie Sue’s Mac and Cheese Stand for the first time. I ordered the Carbonara mac which had pancetta and grana padano. The pancetta gave it a saltiness and the cheese was like a parmesan from a different part of Italy. The dish was very flavouful. I only had the small portion but it was all I needed. Ever since I started going to music festivals, I’d post about the food I ate. I decided that I needed my own Instagram hashtag so over the weekend I made myself #tianaeatsfestivals and retroactively tagged a bunch of past posts. You can find my food adventures there. In Ontario, it’s getting harder to find stuff I haven’t previously tried! Now that TURF post you’ve all been waiting for! 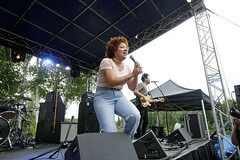 Here’s what I ate at the festival. Delight fries from Delight Bite. It was fries with mayo and oregano. It was super simple but pretty good. Mango peach fish tacos from 50 Pesos. This was definitely my favourite new eat of the weekend. The fish was perfectly fried and there was a perfect combination of sweetness and textures. I really wanted to like this Apple Pie Waffle from Sweet Teeth Vegan, but I thought the lack of egg made the waffle kind of lifeless. The toppings helped saved it though as the candied apples, nuts and vegan soft serve were actually delicious. This Jerk Chicken Mango Salad from Come and Get It was light and refreshing to have in between fried meals. Smoothe Operator refreshed me with a lemonade. So did this Cucumber, lime, mint grapefruit popsicle from my favourite place The Pop Stand. Mill Street and Hop City Brewing had a free samples station on site. Of course I couldn’t resist Indian Tacos from The Flying Chestnut Kitchen at every festival. Chocolate & Vanilla cannolis from Holy Cannoli were a must eat. I also tried a Guinness Gingerbread popsicle from The Pop Stand. Iroquois Kettle Corn’s white cheddar flavour was highly addictive. This fried shrimp and fries combo from Mustache Burger was a bit too much fried stuff in one go. I almost forgot to post about the yummy goodies I had at Camp Wavelength. This year they expanded their food choices a bit so there was more than just burgers. Of course I couldn’t resist getting some delicious popsicles from The Pop Stand. I had so many I can’t remember the flavours of all of them! 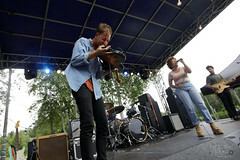 Last weekend, I was at NXNE. It’s a festival I’ve been going to since before I was even old enough to go to shows. I used to volunteer and used to think it was some of the best times ever hopping between clubs to see bands. This year it wasn’t like that. There were very few club shows and they also introduced a 2 day festival within a festival that happened near Port Lands in a gigantic (an understatement) parking lot. 30 degree weather made it kind of unbearable but I still found ways to enjoy my time, including finding a photo booth of course! There wasn’t too much in terms of food but I did have 3 tacos from La Catrina food truck. They had a 3 taco combo for $12. I picked pork, chicken and fish. I liked the filing but I thought the taco could use some toasting. The other place I ate at was a BBQ stand beside the Texas Tourism sponsors. I had this delicious chopped brisket sandwich. They literally chopped a slab of meat right in front of me and slathered it in BBQ sauce. Can’t go wrong with brisket! That was most of my eating at that festival. There wasn’t a huge selection of food choices (the first day only had 3) and I had tried most of the other selections. Onto eat the next thing! Bestival happened this weekend and I had a few snacks while there. Here are a few of the things I stuffed my face with. The first was Eva’s Original Chimney in Apple Pie. It was an ice cream in a donut-like pastry and it was filled with apple pie stuffing. It felt like a warm hug. 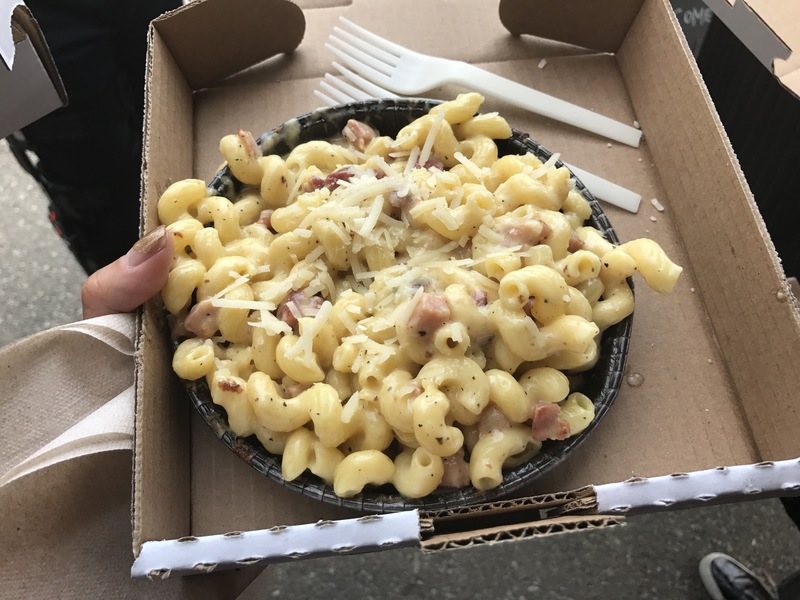 This Jerk Chicken Mac and Cheese (forgot the truck name) was ok, a little on the cold side but full of delicious chicken and peas. A panda from Tokyo Smoke made me a latte shaped out of a panda out of their mobile coffee shop that was bicycle powered. Lastly, I had this delicious and juicy Jerk Chicken & Mango sandwich from Come and Get It. I’m coming for you Toronto food trucks!